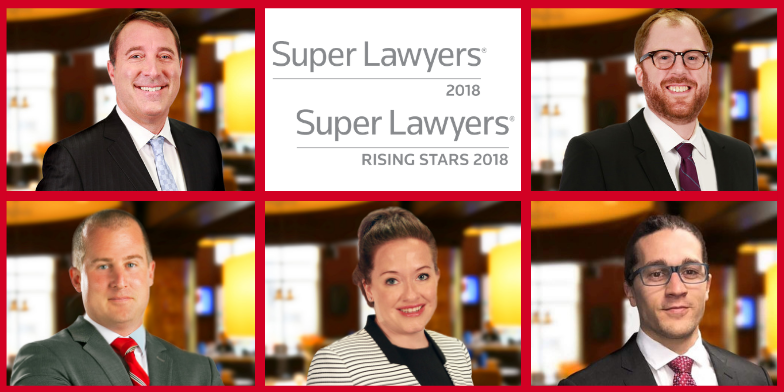 Attorneys Recognized by SuperLawyers and Rising Stars | Hupy and Abraham, S.C.
Hupy and Abraham is pleased to announce that five attorneys have been recognized on 2018 Super Lawyers and Rising Stars lists. Managing Partner Attorney Jason Abraham was selected to the 2018 Wisconsin Super Lawyers list. The Super Lawyers list provides visibility to an attorney who exhibits excellence in the practice of law. It is highly regarded as the premium source for outstanding lawyers who have attained a high degree of peer recognition and professional achievement. Attorney Jason Abraham was chosen to the 2018 Wisconsin Super Lawyers list based on a multiphase selection process. Peer nominations and evaluations were combined with third-party research. Attorney Abraham was selected because of his superior evaluation in 12 areas of professional achievement. Only five percent of lawyers in the state of Wisconsin can be named to Super Lawyers. This is the fifth consecutive year Attorney Abraham has been named to the Wisconsin Super Lawyers list. After joining the firm in 1993, Attorney Abraham became shareholder in 1999. Shortly following that, he became Managing Partner and the law firm’s name changed to Hupy and Abraham, S.C. Licensed to practice in Wisconsin, Missouri, Iowa, the United States District Court for the Eastern and Western Districts of Wisconsin, Attorney Abraham is a certified Trial Specialist. He has settled or tried over $200 million for his clients. Firm President, Attorney Michael Hupy, was selected to the first Super Lawyers list and has been AV rated by Martindale-Hubbell for over 20 years. The level of excellence exhibited by Hupy and Abraham's owners has impacted the work that its Associate Attorneys do for their practice and clients. Attorney Robert Domol was selected to the 2018 Wisconsin Rising Stars list, which uses a process similar to the Super Lawyers List. To be eligible for inclusion in Rising Stars, candidates must be 40 years old or younger and not more than 2.5 percent of lawyers a state or region are named to this list. Attorney Domol joined Hupy and Abraham in 2014 and works out of the firm’s Appleton office. Attorney Domol has been named to the Wisconsin Rising Stars list every year since 2012. Additionally, Attorneys Jenna Green, Thomas Hillers and Benjamin Lynch have been chosen to the 2018 Great Plains Rising Stars list. The Great Plains region consists of North and South Dakota, Iowa and Nebraska. Attorneys Green, Lynch and Hillers work in Hupy and Abraham, S.C., P.C.’s Des Moines office and joined the firm in 2015, 2016 and 2017, respectively. Hupy and Abraham would like to extend warm congratulations to all attorneys recognized this year for this well-deserved achievement!